There are over 1,000 'golden ticket' chances to win instantly! Pick up your Official Xbox Magazine from WHSmith this month and inside you could find a free Xbox Game Pass subscription for up to one year. The new issue has Rage 2 on the cover and is on-sale right now - so head down to WHSmith fast. There are 100 one-year Game Pass subscriptions (worth an RRP of £89.99), and 1,000 one-month subscriptions to be won, which means there are over 1,000 chances to access over 100 great Xbox games for free, immediately. How do I win an Xbox Game Pass at WHSmith? Simply pop down to your nearest WHSmith newsagent today, buy the May 2019 issue of OXM with Rage 2 on the cover, and if you’re lucky enough to find a Game Pass code card inside the magazine, you can instantly redeem it for up to a whole year’s subscription. 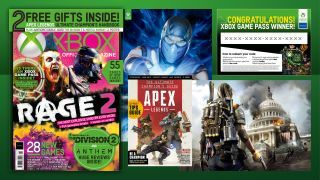 Every copy of OXM features an essential Apex Legends Ultimate Champion’s Guide and a double-sided The Division 2 and Mortal Kombat 11 poster, plus all the great stuff you’d expect in OXM - but only magazines bought in WHSmith could contain the chance to instantly win an Xbox Game Pass subscription. Among the 100+ games currently available with an Xbox Game Pass sub are Forza Horizon 4, Just Cause 4, Sea Of Thieves, Crackdown 3, Gears of War 4, Halo The Master Chief Collection, Halo 5, State Of Decay 2, Playerunknown’s Battlegrounds, Shadow of the Tomb Raider and more.